Stamp of the Week set featured April 1st – April 6th- Birthday Cheer. Today I’m featuring a quick card I made using the Birthday Cheer Stamp Set and matching dies. Just a quick note I used the Cherry Cobbler & Pool Party blender pens to color in the cupcakes after I attached them to a piece of Whisper White Paper . I also used the Dot to Dot embossing folder that I think works so well with this stamp set. Same card with a different color Combo using the Birthday Cheer Stamp set and matching dies. This card features the colors Flirty Flamingo and a mix of the light Bermuda Bay with the Dark Pool Party Blender Pens. I also used glossy white card-stock for the back instead of the normal white. I found that the blends actually don’t work as well on this paper as they do on the whisper white card-stock. Remember that when you purchase the Birthday Cheer set as the stamp of the week for April 1 – 6th you can get a free card kit when you purchase before the 14th of April using the special hostess code RAFQT4TW . The stamp set is just $20 however I recommend getting the bundle for $45 so you can make cute cards like this one using the die. In the Birthday Cheer stamp of the week kit. You will receive a kit to make 1 each of 4 different cards. To learn more and get all the details check out the Birthday Cheer Page. Be sure to check back the rest of the week for more samples using this fun set. I’m so excited to introduce my new line of Stampin’ Events. These will be a blended event so I hope you will enjoy this new format. There will be several different types of events that you can participate in. Here’s a quick list. Click on any for more details. The events will be held online every month on Tuesdays and Thursdays from 2:30 pm – 3:00 pm mountain time. They will be held as a private Facebook Live event. I will also post them on a private YouTube account. This means that only those who purchase will be able to access them. Check out each event to find out how to purchase. I’m super excited about these new blended events and look forward to sharing them with you. I know this month is close to the end, but I wanted to give you a chance to pre-order for April’s events during March so you can earn Sale-A-Bration products. All of the above listed events will be starting in April . Click on any of the events to learn more. I’m trying to meet a goal for Sale-A-Bration so anyone who places and order whether it’s for a kit or just an order by 10:00 PM mountain time on March 31st will receive a free gift from me. This is the perfect bonus incentive to order what you need for the upcoming projects and get an extra bonus plus earn sale-a-bration items for every $50 you spend. Be sure to use HOSTESS CODE: RAFQT4TW when placing your online order . Here’s a sneak peak of the project you will receive when you order the Birthday Cheer Stamp of the week Kit. Here’s a sneak peak of one of the projects you will receive when purchasing the Piece of Cake Class. Sneak peak of one of the projects from the technique club. I wanted to share this quick and easy card with you today. It was created using Stampin’ Up!’s Butterfly Gala stamp set. In the second card and saying I used sponge daubers to apply the ink to give it a more blended look. The 1st card is just stamping directly on the card with the ink and the second card is using the the sponge technique. I created a quick video to show you how simple it is to create this fun blended look. I really like the extra dimension it seems to give to the stamped image. Here’s a close up of the difference between the two different butterfly looks. This is what it looks like when you stamp directly onto the images without using the sponge daubers. This is the same image using the sponge daubers to ink up the background stamps for the butterfly rather than stamping directly into the ink. Using this technique I was able to add a little bit of each color to the stamp and kind of blend them. You’ll also notice that the colors aren’t quite as bold and defined using this technique giving it a more subtle feel. Here’s a close up of the greeting image using the sponge daubers to ink up the stamp. She loves getting her very own kit every month. I loved the January Paper Pumpkin and my little girl was so excited to make them for her valentines this year. There were tons of extra parts so we decided to use them to create Valentine’s for my son’s class as well we just needed a packaging idea. Here’s what we came up with. Here’s a quick video of how I created it. I used the envelope punch board item # 133744 for $20.00 to create them. Here’s a couple of alternates I made using the same paper pumpkin kit. We’ve been told that the March kit will include a special surprise for their anniversary. Be sure to sign up before March 10th to get yours. Remember now is a great time to give paper pumpkin a try. When you order a 3, 6 or 12 month paper pumpkin prepaid subscription you can earn free sale-a-bration items. Have you had a chance to try Paper Pumpkin yet? Do you know what Paper Pumpkin is? Now is the time to try it and learn more. Paper Pumpkin is a fun easy way to craft each month. Our monthly kits are delivered to your home each month and include fun and easy projects for those of all ages. 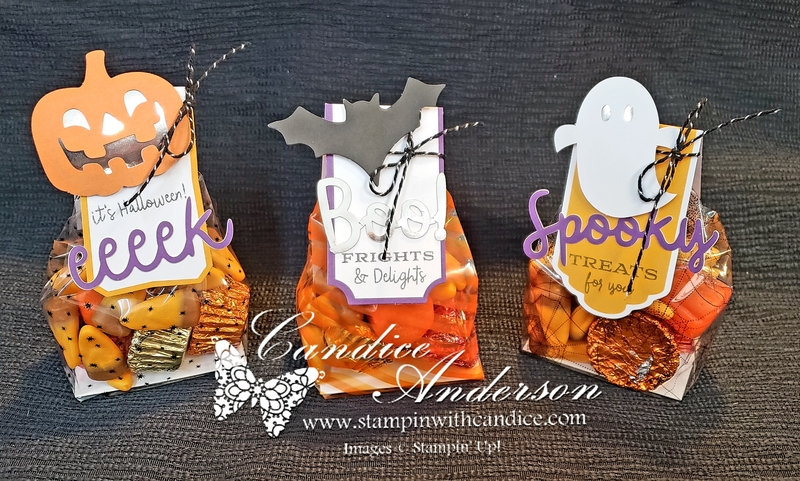 I think one of the best things about Paper Pumpkin is that it’s easy to share because each kit has plenty of projects to go around. My little girl and I love to create these projects together each month. Here’s a picture of her with her finished creations from last month. 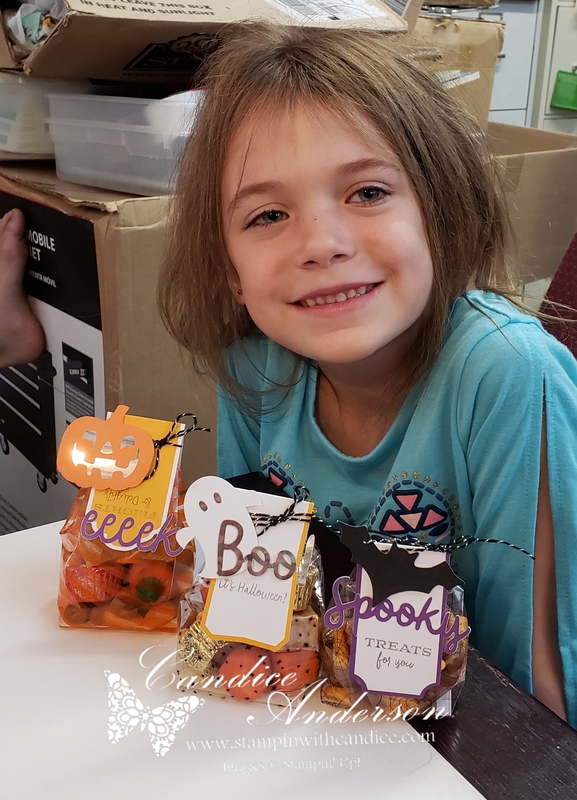 I don’t know about you but I have a hard time just letting her use my regular products without a lot of supervision, however I can let her do Paper Pumpkin on her own or we can create them together (that’s our favorite.) She loves to spend time with me creating her own fun projects. This is a perfect gift as well so go ahead and give it a try today. Here’s my cute creations from last months. Remember today is the last day to take advantage of this great sale. Try it for just $5.00 additional kits are $19.95 per month (includes shipping.) Click here to sign up. New subscribers enter the code FLASH1018 before the sale ends to receive this special introductory price. Make sure you put the code in the prepaid/promo code section to get the special price before you click continue.